Do you need a day off, away from it all or do you simply want to add a fun day-trip to your already awesome vacation in Curaçao? Then the Friday Snorkeling Trip is just right for you. Close your week off with a relaxing and also activity-packed trip along the coast of our beautiful island. We will visit the world-famous Tugboat and offer you colorful corals for as far as your eyes can see. A trip on the BlueFinn is thoroughly enjoyable, with the sun, wind and sea-spray in your face. 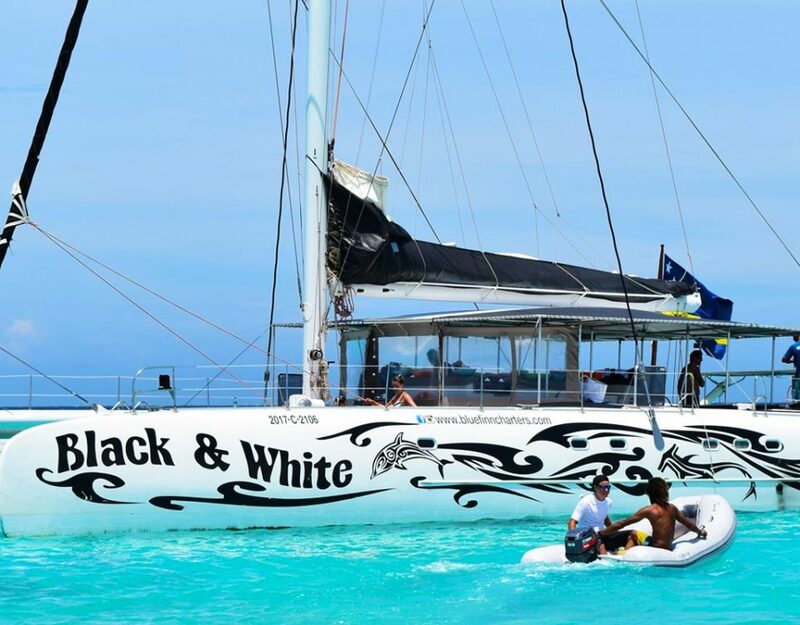 The build of a catamaran lowers the possibility of seasickness to almost non-existing, so this is a perfect choice for people prone to motion sickness. The crew is there to inform you about safety and background details of each site visited during the tour. Also, they are there to serve endless drinks and a yummy lunch. 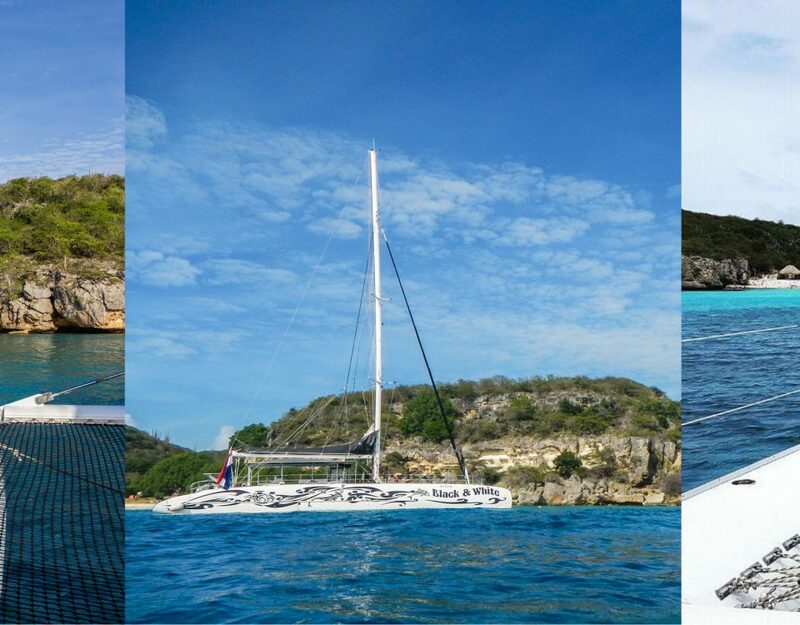 The Friday Snorkeling Trip - What to Expect! A guarantee: you will be satisfied at the end of this trip. You will be able to snorkel or dive to your heart’s content at three different locations. There is a big chance you will meet dolphins and the crew will take care of your every need. First, we double back and meet up with our friends from the Dolphin Academy for a beloved bonus item of this trip. 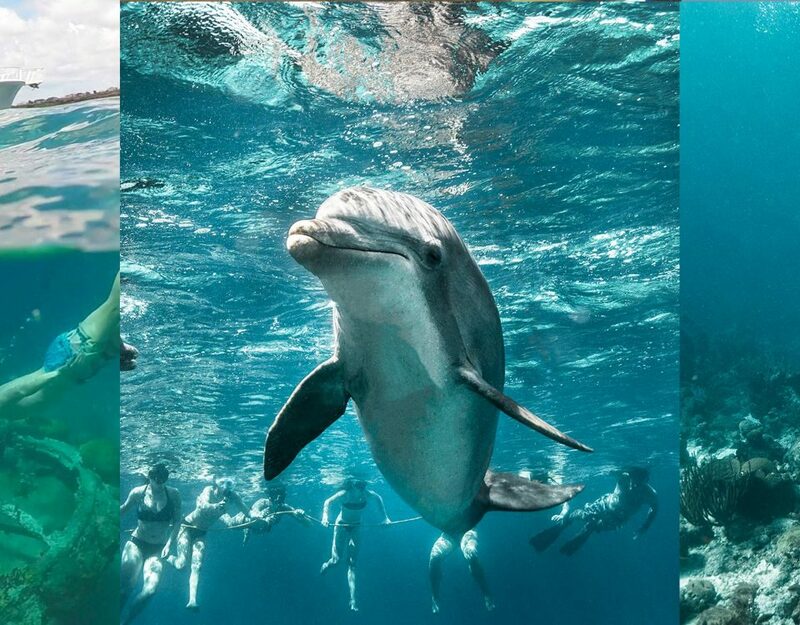 When in luck, and if these wonderful creatures are willing, all passengers can jump in the water and observe the open-water training up-close. This is a very unique opportunity to see dolphins frolicking in the open sea. The next stop is the Tugboat, which is visited by diving enthusiast from all over the world. You can stay as long as you want in the water, exploring the corals and the teeming sea creatures that make them their home. Around noon, a most satisfying lunch is served on board of the BlueFinn with endless drinks served by the crew. For desert, a tour of the mansions in Spanish Water before we mosey back down to the dock. The Dolphin Academy was opened in 2002 in the Curaçao Seaquarium and its mission is to inform and educate visitors about dolphins. They do this through several programs both in their enclosed environment and the open sea. It is during these excursions that the BlueFinn meets up with their friends of the Dolphin Academy to give their passengers a once-in-a-lifetime opportunity to observe dolphins up close in the open water. A long, long time ago, a mishap with an anchor sunk this little tugboat just off the cliffs of the Quarantine & Slave Hospital ruins. Fish, corals, eels, octopus and other animals have made the tugboat their home and it’s a spectacle to behold. Just a few meters below surface, snorkelers can enjoy this site as much as scuba divers. For lunch, the crew will move further into the Caracas bay, where there is an even more spectacular - believe it or not - snorkeling site. When diving or snorkeling along the pier and the offshore drilling rig stationed there, you would think that an open immigration invitation was sent to the whole sea population: a multitude of fish and other sea creatures can be found it this area! You will wish for more eyes and air to continue exploring this area to its fullest. In the meantime, the crew prepares a filling lunch served up buffet style top deck. While the grill is fired up, you can enjoy a drink, catch some rays and drink in the view of the historic Beekenburg Fort. To give your lunch the time to settle, the BlueFinn is off to Barbara Beach’s inlet to tour the exclusive Spanish Waters. So much history is tied to this area, as it was used by the indigenous Araways through the conquering Spanish, leading to the building of the Beekenburg Fort seen earlier on this very same trip. As can be expected for a Caribbean island, there are many boat and yachting fans settled here. You will enjoy ogling the many majestic yachts anchored in the sheltered waters with the backdrop of the Tafelberg (Table Mountain). If you ever contemplated living on a sunny island, you will be sorely tempted by the mansions at sea on display here. Afterwards, passengers are safely returned to the point of origin. Curaçao has exchanged hands several times in her early history. The British, Spanish, Dutch and Portuguese all wanted this strategic port and it’s no wonder that there are many fortifications found to this day. One of them is Fort Beekenburg, built in 1703 to repel invaders. It is here that Pedro Luis Brion defeated the British in 1805. This area of the Caracasbay was used as a quarantine station for ships with contagious diseases. 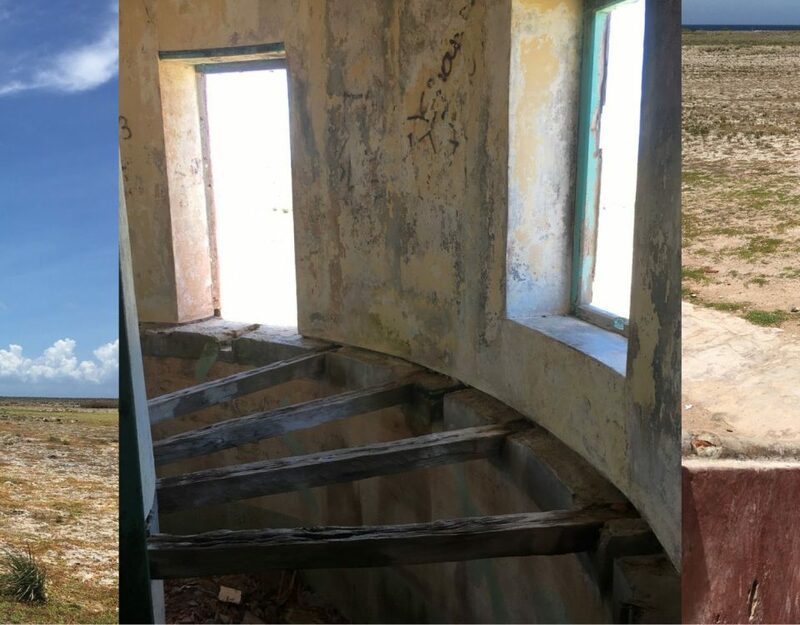 A hospital was built next to the fort for the ill. Overlooking the Tugboat diving site, the Quarantine Building was erected in 1883 for healthy seamen. They were kept here until their full recovery. Around the same time, in 1874, digging activities commenced on the Tafelberg (Table Mountain) for phosphate. Much later in 1912 the current mining company took over the activities still going on today. Phosphate mining was abandoned for the more profitable limestone. The quarry is also home of the exclusive Barbara Beach Resort. More recently, part of the peninsula was given to Shell and they built as many as 48 tanks from 1925 on. After the oil refinery left, these tanks were demolished and they are nothing but a memory. Now the whole area is reserved for (eco)tourism and recreational development as can clearly be seen in Jan Thiel. This whole area, extended to Seaquarium Beach, is so worth a visit. Of course, from a different perspective onboard the BlueFinn!